This model is available as an automated tutorial by selecting Model Examples and Tutorials... > Multiphysics > Heat Induced Stress in a Brake Disc from the File menu. The geometry only includes the cross section of the brake disc, and not the brake pad. Although this could be modeled with a single rectangle, the brake pad only touches part of the disc, so two rectangles are used to split the boundary into sections. Enter 66e-3 into the xmin edit field. Enter 75.5e-3 into the xmax edit field. Enter 5.5e-3 into the ymax edit field. Enter 75.5e-3 into the xmin edit field. Enter 113.5e-3 into the xmax edit field. Enter 0.0005 into the Grid Size edit field. The material parameters are taken from the reference assuming the brake disc is made of cast iron. Make sure that the material parameters are specified in both subdomain halves of the disc. Select 1 and 2 in the Subdomains list box. Enter 0.29 into the Poisson's ratio edit field. Enter 99.97e9 into the Modulus of elasticity edit field. Enter 7100 into the Density edit field. Enter 1.08e-5 into the Thermal expansion coeffient edit field. Enter T-(20+273.15) into the Temperature edit field. Enter 51/1.44e-5/7100 into the Heat capacity edit field. Enter 51 into the Thermal conductivity edit field. Symmetry with zero normal displacement is assumed at the lower z = 0 boundaries. Select 1 and 4 in the Boundaries list box. The brake force is applied to the upper right section of the disc which magnitude is calculated as a function of the material of the disc and pad with a friction factor. See the reference for more details. Enter 7109581.6204*r*(1-t/3.96) into the Inward heat flux edit field. Select Time-Dependent analysis with a simulation time of 3.96 seconds, and also set the initial temperature to 20 °C. Enter 20+273.15 into the Initial condition for T in subdomain 1 edit field. Enter 20+273.15 into the Initial condition for T in subdomain 2 edit field. Enter 3.96 into the Duration of time-dependent simulation (maximum time) edit field. Enter 3.96/50 into the Time step size edit field. After the simulation has completed, inspect the stress and temperature distributions at different times. Especially for the early times it is very clear that both the temperature and stress are located at the interface between disc and pad, and later spreads throughout the disc. 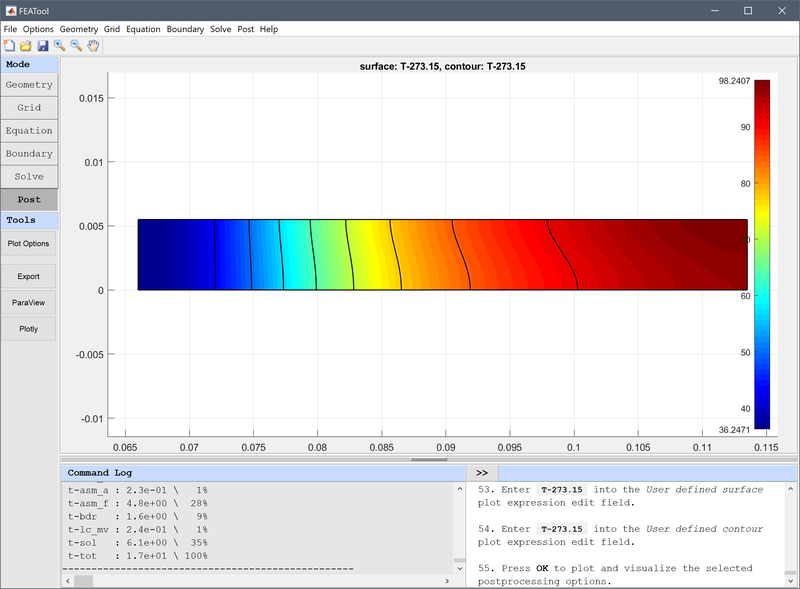 Enter T-273.15 into the User defined surface plot expression edit field. Enter T-273.15 into the User defined contour plot expression edit field. The temperature has increased significantly at the final time, and should span between about 35 and 90 degrees. The heat induced stress in a brake disc multiphysics model has now been completed and can be saved as a binary (.fea) model file, or exported as a programmable MATLAB m-script text file, or GUI script (.fes) file. Adamowicz A. Axisymmetric FE Model to Analysis of Thermal Stresses in a Brake Disk. Journal of Theoretical and Applied Mechanics, 53, 2, pp. 357-370, Warsaw, 2015.